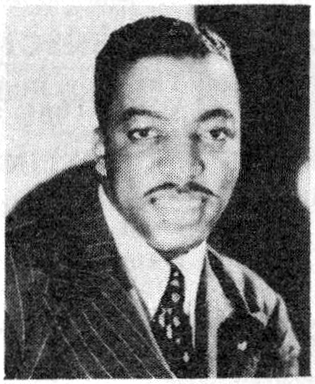 Erskine Hawkins in 1936 or earlier, pictured in the 1942 Victor and Bluebird Catalog. Right up there in the pantheon of great jazz trumpeters resides the “Twentieth Century Gabriel”, bandleader Erskine Hawkins, whose popular recordings helped to define the Swing Era. Erskine Ramsay Hawkins was born in Birmingham, Alabama on July 26, 1914, named for local industrialist Erskine Ramsay, who promised to open bank accounts for boys named in his honor. He attended Birmingham’s Industrial High School and played trumpet in the band under director Fess Whately before graduating to the State Teachers College. There, he led the ‘Bama State Collegians, with whom he later traveled to New York to embark on his recording career. Hawkins cut his first two records on July 20, 1936 for Vocalion, debuting with “It Was a Sad Night in Harlem”. Thereafter, he returned to the Vocalion studio four times, recording four sides at each session, resulting in a total of twenty. He also secured a gig as house band at Harlem’s renowned Savoy Ballroom, alternating with Chick Webb’s orchestra, an arrangement which lasted a decade. Billed as the “Twentieth Century Gabriel”, as his popularity climbed, he was signed by the RCA Victor Company in 1938 to record for their Bluebird label, a fruitful arrangement that resulted in prolific recordmaking and numerous successes, including his own “Tuxedo Junction” in 1939—most famously covered by Glenn Miller’s orchestra—and “Tippin’ In” in 1945. He remained with RCA Victor, eventually graduating to their flagship Victor label, until 1950, after which he moved to Decca’s budget label Coral. After the conclusion of the Swing Era following World War II, like so many of his contemporaries, Hawkins’ fame began to wind down, but he remained active as a musician. From the 1960s until the end of his career, he led the house orchestra at the Concord Resort Hotel in the Catskill Mountains of New York. Erskine Hawkins died on November 11, 1993 at his home in New Jersey. Vocalion 3567 was recorded on April 19, 1937 in New York City. The ‘Bama State Collegians are Erskine Hawkins, Wilbur Bascomb, Marcellus Green, and Sam Lowe on trumpets, Edward Sims and Robert Range on trombones, William Johnson and Jimmy Mitchelle on alto saxes, Paul Bascomb on tenor sax, Haywood Henry on clarinet and baritone sax, Avery Parrish on piano, William McLemore on guitar, Leemie Stanfield on string bass, and James Morrison on drums. First up, the ‘Bama State Collegians play a swinging orchestration of the Stephen Foster standard “The Old Folks at Home”, here given the familiar title “‘Way Down Upon the Swanee River”. 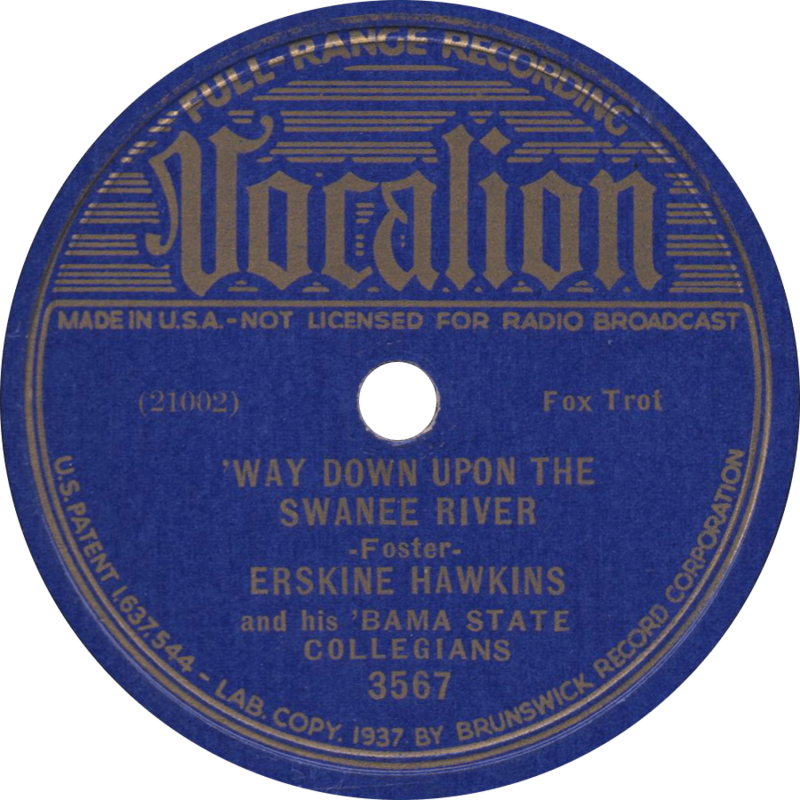 ‘Way Down Upon the Swanee River, recorded on April 19, 1937 by Erskine Hawkins and his ‘Bama State Collegians. On the flip, they play an outstanding jazz rendition of the 1921 Henry Creamer and Turner Layton composition “Dear Old Southland”, quite probably my personal favorite swing side. Brian Rust notes that this piece was arranged by trumpeter Sam Lowe, and I suspect the former side was as well, though not noted as such. 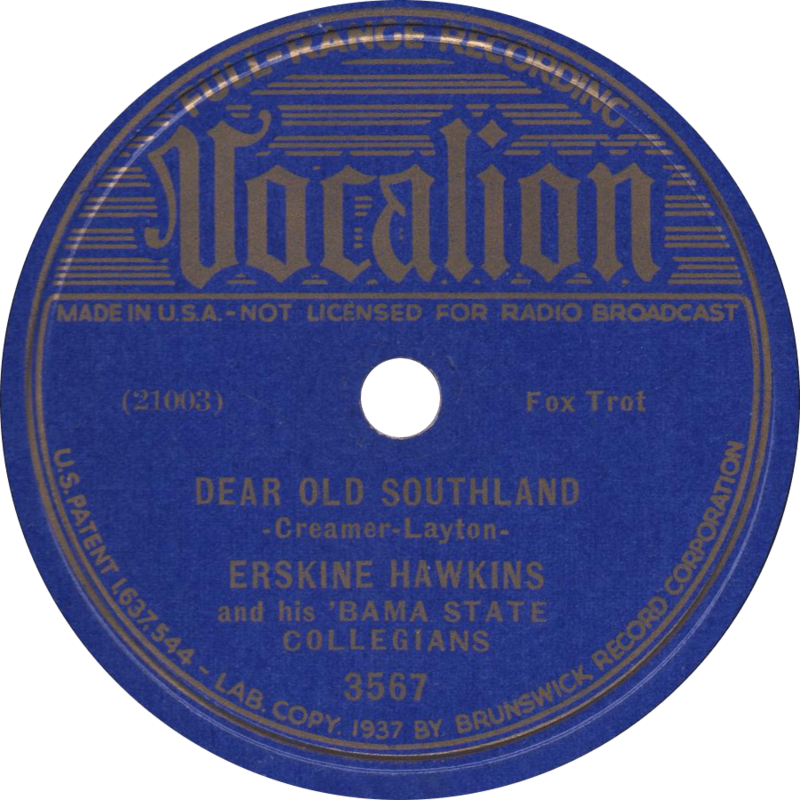 Dear Old Southland, recorded on April 19, 1937 by Erskine Hawkins and his ‘Bama State Collegians. Aw, ain’t it nice to be nice when you can be nice.